Tom and Jerry is a favorite classic cartoon for many kids. I enjoyed it as a kid and now my kids love it. There are a some great lessons that kids can learn as they continually watch the cat and mouse chase each other. Just because your little doesn’t mean your helpless. As you know Jerry is much smaller than Tom but that doesn’t stop him. 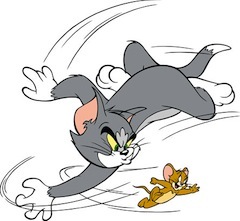 Jerry can usually outwit Tom in almost any battle. He proves that brains are better than brawn. Many things can be said without words. If you’ve ever seen the show, you know that there is rarely any talking. Though they’re a quiet bunch, Tom and Jerry can be quite entertaining and expressive. They also have a lot of fun. The adults in the house have the last word. No matter how crafty and quick Tom and Jerry are or how long there quarrel lasts, it always seems that man or woman of the house has the last word. This usually comes with a big boot kick out of the house. Actions have consequences. If Tom does something to Jerry, Jerry will usually come back with revenge and vice versa. This is also shown in the lady of the house kicking them out for causing such a disastrous mess. Do to others as you would have them do unto you. Tom is often trying to get Jerry and so Jerry does the same thing back to him. In a few limited episodes they pay each other in kindness. Know your limits. Tom messes with little Jerry all the time, but he knows better than to mess with the big dog. He knows he can’t overpower the dog and it’s time to back off. Being cute can be used to your advantage. Jerry is a cute little fella but he sure knows how to get Tom going. He also knows how to impress the big dog and use that to his advantage. Hair grows back. Tom is usually the one that gets his hair scalped. Sometimes it’s because of Jerry. Other times the big dog lays into him. Either way, his hair always grows back. If at first you don’t succeed try, try again. Tom wants to catch that cute little mouse, Jerry. Nothing will stop him. He can get hurt, kicked out of the house, or chased by a dog three times his size. If he doesn’t catch that mouse, he’ll be back again for more chasing. If you have a pet mouse, keep it away from the cat. Cats love mice and I don’t mean that in a romantic way. If you have a pet mouse, your cat will try many crafty ways to get at it. Make sure you keep your cute little mouse locked up and safe from the cat. Kids can learn many great lessons from Tom and Jerry. Despite the never-ending game of cat and mouse tag in every show, it seems to entertain people of all ages.